Vicarious liability of a rental car company under Florida law. The State of Florida is known as a prime tourist destination not just in the United States but globally: in fact, by the mid-2010s, Florida had become the top travel destination in the world. And the Sunshine State seems to be getting more and more popular: in 2015, the number of people coming to visit Florida and enjoy our beaches and other attractions (like Disney World) broke records for the third straight year. This is great news for our state’s tourism industry as well as the state’s economy as a whole. And it’s especially good news for the local rental car market. For rental car companies like Hertz or Budget or Avis, Florida is a huge profit center as many of these tourists and visitors will need or want to rent a vehicle to drive during their stay. 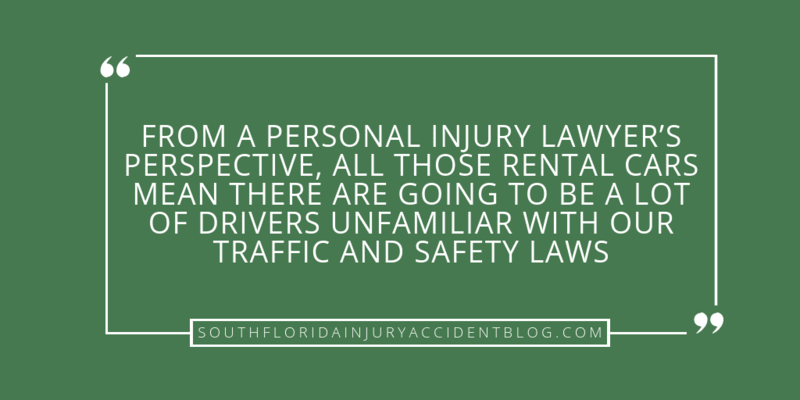 From a personal injury lawyer’s perspective, all those rental cars mean there are going to be a lot of drivers unfamiliar with our traffic and safety laws. When there is a car crash involving a rental car in Florida, who is liable? What duty does the rental car company have here? Does it matter if the rental car driver is at fault? 2. The liability of the rental car company to third party victims of the car accident involving their rental car. After a serious motor vehicle accident, when it comes time to pursue damage claims and file lawsuits (if necessary), then victims of motor vehicle accidents involving a Florida rental car may be very surprised to learn that they may not be able to sue the owner of the rental car. This is because both federal and state law, as well as the rental lease agreement itself, work to protect the big rental car company / owner (Goliath) from the claims of the injured person (David). In 2006, as part of what was known as the “highway law” (the Safe, Accountable, Flexible, and Efficient Transportation Equity Act), a new federal statute went into effect called the “Graves Amendment” (49 U.S.C. § 30106 (2006)). It was a major victory for rental car companies. Why? It barred all the states, including Florida, from making rental car companies vicariously liable for the personal injuries resulting from car crashes involving their rental cars. What did it do? This federal law prohibits the State of Florida from making a rental car company share liability for an accident involving its vehicle just because it is the owner of the rental car. To hold the rental car company liable, the rental car company has to be proven negligent in some way. This allows injured victims in a car crash to hold the rental car company liable for things like (1) failure to train their employees properly; (2) failure to supervise their workers; (3) negligently entrusting the rental car to a driver they shouldn’t have allowed to take the wheel; (4) failing to keep the rental car properly maintained; etc. However, if the injured accident victim cannot show that the rental car company acted in some way that was negligent, then the rental car company, as owner, cannot be held vicariously liable for the accident victim’s damages. Rosado v. DaimlerChrysler Fin. Serv. Trust, 112 So. 3D 1165 (Fla. 2013). This is true even though Florida’s “dangerous instrumentality” doctrine will find liability for other kinds of owners of vehicles who have loaned or otherwise allowed their vehicle to be driven by someone else, as for example: (1) parents who allow their children to drive their cars; or (2) employers who allow their employees the use of a company car. Before the passing of the Graves Amendment, if you were hurt in an auto accident involving a rental car here in Florida, then the rental car company, as owner of that rental car, could be held financially liable for your injuries. Courts took the position here that if a rental car company, for instance, allowed a driver from overseas to take the wheel of their Ford SUV, and then that foreign driver got in a wreck and people got hurt, then the rental car company shared the blame for the accident. Under Florida’s “dangerous instrumentality doctrine,” when the owner of a “dangerous instrumentality” (like a car) voluntarily allows someone to use it (like a driver who leases it), then if that person who has been trusted with that vehicle operates it in a negligent manner and causes harm, the owner who allowed them to use the “dangerous instrumentality” shares responsibility for what has happened. The “dangerous instrumentality doctrine” is still applied in Florida courts. It just cannot be applied to rental car companies now, because of the federal statute called the Graves Amendment which “pre-empts” the state law. As for the injured parties in a car accident, rental car companies have tried to limit their liability here as much as they can. In the contract language between the rental car company and the person renting the vehicle, it is common to find boilerplate that states the person who leased the car agrees to follow certain steps in the event of an accident or otherwise be barred from seeking damages from the rental car company. The rental car documentation may have things like deadlines for when the rental car driver must report the accident to the company-owner; how that reporting must be done, and to whom; the need for obtaining police assistance at the accident site; etc. Here, the rental car company is using language in the lease agreement to limit its liability for any damages suffered by the person who is renting the car from them (the “lessee”). That’s just in case the language of the Graves Amendment doesn’t work to protect the rental car company from claims brought by the driver who leased its vehicle. As noted above, the law on the liability of rental car companies for the negligence of the renters of their vehicles was substantially altered by federal law. Formerly in Florida, the liability of a rental car (short term rental) company in Florida for the negligence of a renter (or other permissive user) was unlimited. After the federal law was passed (the Graves Amendment), a car rental company is only liable up to the extent the financial responsibility requirements of the state where the rental is made. In Florida, a rental car company is only required to have $10,000.00/$20,000.00 bodily injury liability limits, which means those limits are the extent of the rental car company’s liability in this state where the case is solely based on the negligence of the renter or other permissive user. However, if there is direct negligence of the rental car company which causes an accident and injuries, then the car rental company can be held liable for an unlimited amount. For example, if the car rented has not been maintained properly and that results in an accident, the company is itself negligent (as opposed to being vicariously responsible for the negligence of the renter- which used to be the law in Florida). The good news is that a victim can still sue the renter for all of the victim’s damages (medical costs, lost wages, therapy expenses, pain and suffering, property losses, and other economic and non-economic losses). Often the renter has his or her own liability policy which may provide coverage for these damages. What protections are there for people who are hurt in accidents involving rental car companies? One protection is offered by most rental car companies: an insurance policy of up to $1 million in bodily injury liability coverage. This is automobile insurance offered by the rental car company itself. It is a separate policy from the driver’s personal automobile insurance policy (which may or may not cover liability involving the rental car). Sometimes, it provides overlapping coverage, where both the policies will provide coverage in the event the policy holder is involved in an auto accident while driving a rental car. Sometimes, it provides protection that is not covered by the person’s personal auto policy. The rental car company will provide protection packages that cover any loss to the rental car itself, as well as to the personal property of the person renting the car, as well as any passengers. All of these legal protections boil down to this: the key in many personal injury cases where a rental car is involved in a serious car accident is the insurance coverage policy owned by the person who leased the car. Their automobile insurance policy on their own car, not the rental car, may help to provide financial coverage for the injury damages sustained by victims in the car crash. In the case of Chandler v. Geico Indem. Co., 78 So. 3d 1293 (Fla. 2011), a woman named Kutasha Shazier owned a Ford Expedition and she had an automobile insurance policy with Geico Indemnity Company (Geico) for her SUV. One hot Florida summer, the SUV broke down, and Ms. Shazier was forced to rent a Hyundai Sonata from Avis Rent-A-Car (Avis). When she rented the car from Avis, she included Geico as the primary insurer on her rental agreement. That same rental agreement had two provisions regarding allowing anyone else to drive that Hyundai: (1) no “additional operators” were allowed without Avis’ written okay; and (2) “unauthorized drivers” would mean that the lease agreement was terminated and any liability protections were void. Nevertheless, Ms. Shazier let her friend Frederick Royal borrow the rental car. He, in turn, allowed his friend Tercina Jordan to drive it. While Ms. Jordan was driving the Avis rental car, she had an accident, crashing the Hyandai into a tree. Children in the car were seriously hurt. One of them died. Claims were brought for personal injuries and wrongful death based upon the negligent driving of Ms. Jordan. Shazier and Avis were also sued. Geico came before the court, arguing that it had no duty under its policy (bought for the Ford Expedition) to defend and indemnify Shazier or Jordan. Geico lost. The Florida Supreme Court held that the person who rented the car, and who had the automobile insurance policy for their own car, could look to that insurance company for coverage based upon the language contained in the policy itself. In the Geico policy, a “substitute auto” is covered just as if it were the Ford Expedition (the owned vehicle) as long as the owner and policy holder gave permission for the “substitute auto” to be used by the other driver. Since Ms. Shazier rented the Huandai as a temporary substitute for her disabled Ford Expedition, the terms of Geico’s policy allowed the rental car to become her “owned car” under the Geico policy, and it was being used with her permission at the time of the collision. The Geico insurance policy coverage would be available to provide for the damage claims brought by the children hurt in the accident. Florida auto accident law can be complicated in any car accident, but it may be particularly complex when the negligent driver is not the owner of the car he or she was driving at the time of the crash. A good piece of advice if you have been harmed in a car accident involving a rental car, is to at least speak with an experienced personal injury lawyer before you file a claim to learn about the issues in this article, including the type of evidence needed to prove a claim and the type and amount of damages you can recover. Most personal injury lawyers, like Alan Sackrin, will offer a free initial consultation (over the phone or in person, whichever you prefer) to answer your questions. What Is The Best Accident Claim Advice I Can Share?